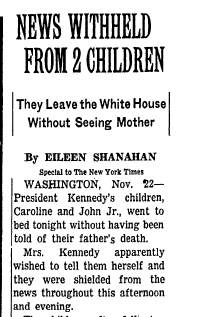 A New York Times story from November 23, 1963. I was browsing the November 23, 1963 edition of the New York Times and saw this article. We know so well the images of the Kennedy kids at the funeral, but I don’t remember hearing about them on the day of the assassination. What a task it must have been for everyone to keep the news from them. I guess I was/we were sent to the neighbor’s. Not sure who ended up telling my brother and me and when about my dad. Not sure my two-year-old brother was even able to process that info. I thought of you when I was writing this, Lisa. I’m sure little John also could not really process what was happening. As he got older, I wonder if he could remember anything from that weekend.